"There is no place like home for the holidays." This past Christmas, I was really striving to avoid the Great Gift Card Exchange both sides of our families seem to have created. I don't mind a gift card, but I really wanted to do something "different". However, my largest problem was that I was stuck. Mentally blocked. I could not think of a single thing to make or buy my parents for a gift. 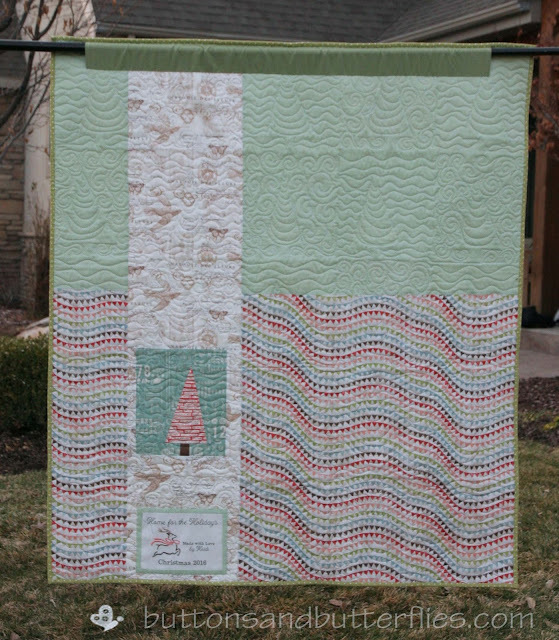 Here I was on Christmas Eve morning, packing for our trip across the country the next day and preparing for Santa's arrival and I didn't know what I was going to do. 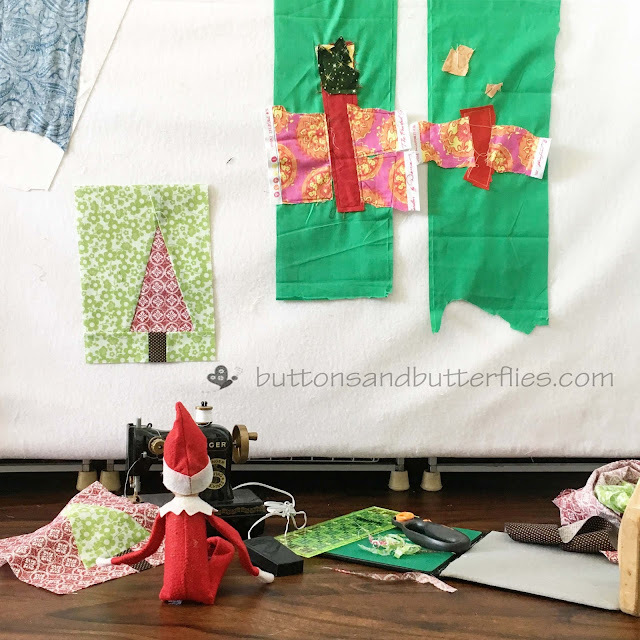 I glanced over at my design board in my Ms. Claus workshops, as I finished wrapping a few more of Santa's gift and the quilt blocks that Buddy the Elf (elf on the shelf) had made a few nights before. 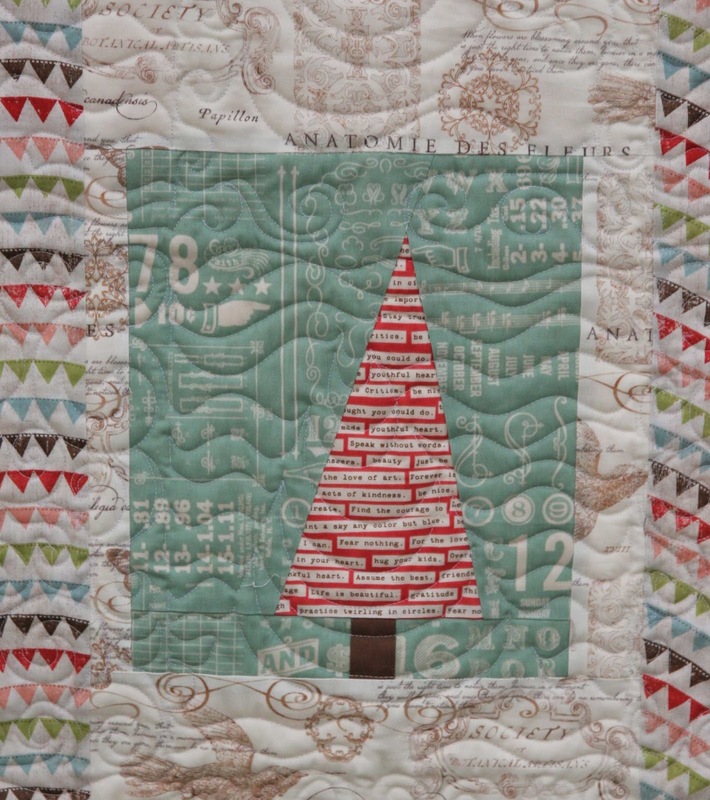 Amy Smart's Modern Tree block glared at me. I recalled how quick I had made the two blocks and my brain fired off "Home for the Holidays" and I knew I wanted to make a quilt for my parents to commemorate this year. My sister was traveling from Kansas with my nephews and my grandparents were going to be shuttled from North Carolina and we were flying in from Salt Lake City on Christmas Day to Virginia. It has been many, many years since we were all together for Christmas. 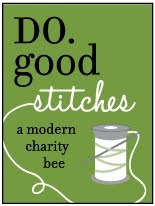 The next challenge was the fabric. 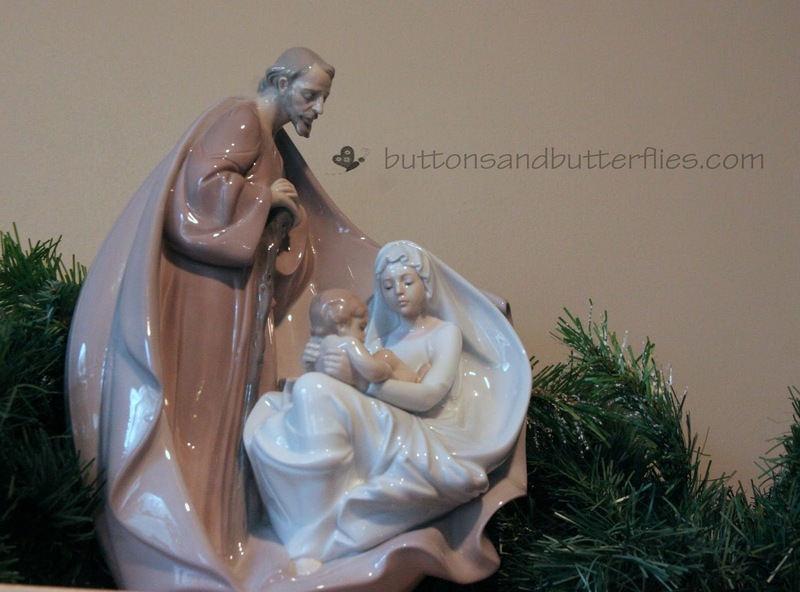 My mom has a very "muted" decorating style and Christmas is no different. 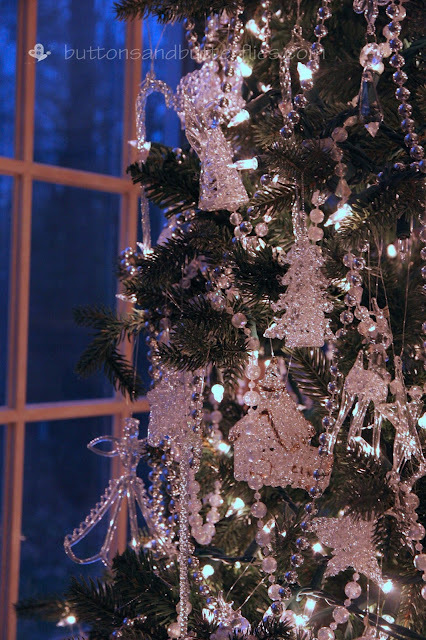 Her tree is covered in white lights and crystal ornaments. No color. 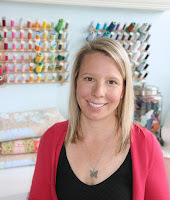 I had a layer cake with all the solid fabrics in her family room colors and I didn't love it. I think I did about five fabric pulls from my stash that were all rejected. 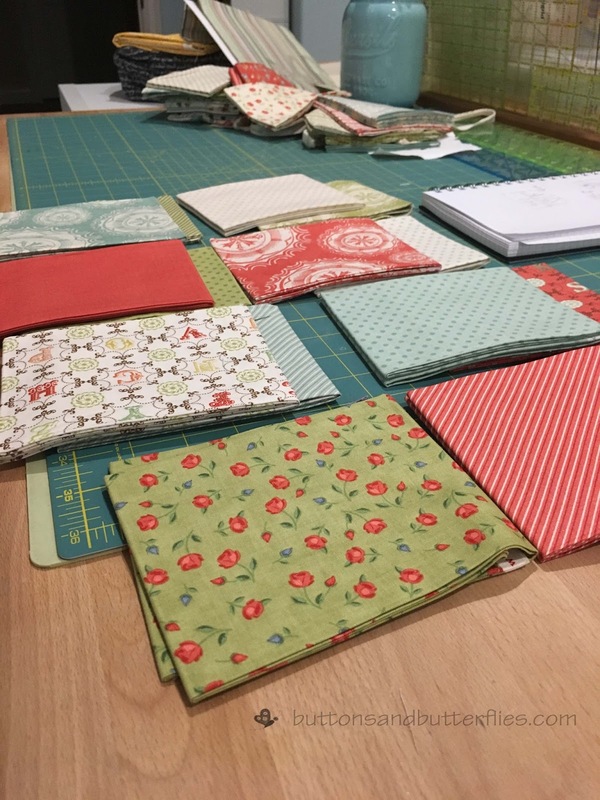 I finally visited my fabric bundles and took a hard look. 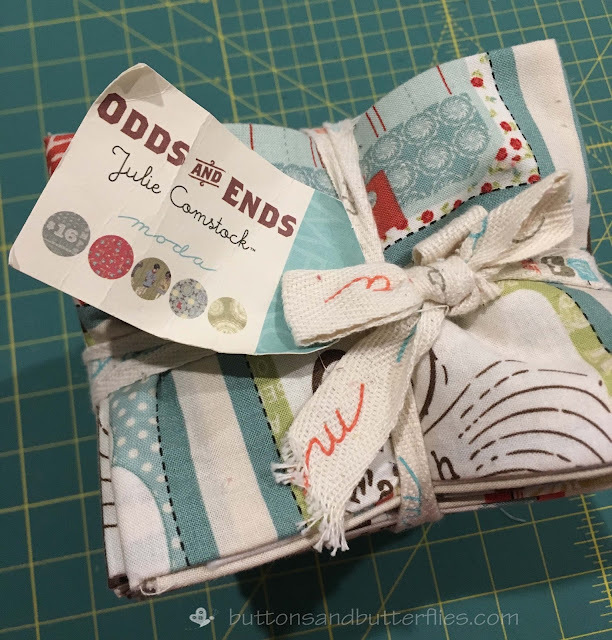 Odds and Ends by Moda Fabrics kept drawing my eye. I'm actually proud of the fact that I had zero fear just ripping the bundle apart to take a good look. 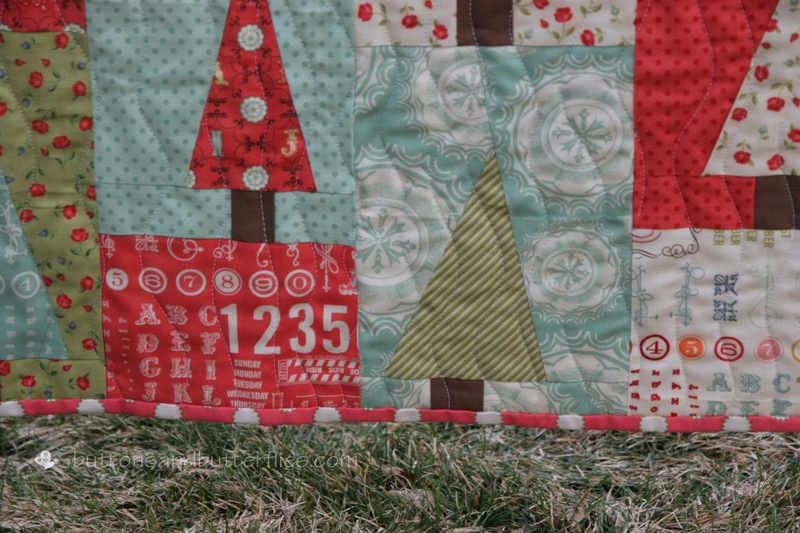 In between laundry, packing, and making Christmas Eve dinner, I mapped out my quilt plan. Amy's tutorial uses 7x9" blocks and I knew I needed bigger to be quicker. I settled on a 10x 11.5" block. I started by cutting 11x12" blocks. It made a nice lap size of 49 x 60" with a five by five layout configuration. After all the bags were lined up at the door, kids sent to bed, the house tidied up, and Santa's packages all settled under the tree and stockings stuffed...I began to press, cut and piece the top. At 10:30pm. As the snow fell outside and the plows came by, I finished the last seam at 2:15am. 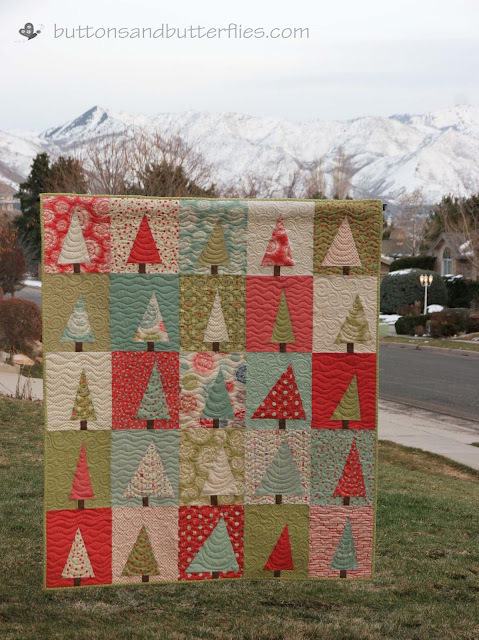 I didn't have a complete quilt, but I was happy to have at least a top to present them when we arrived. 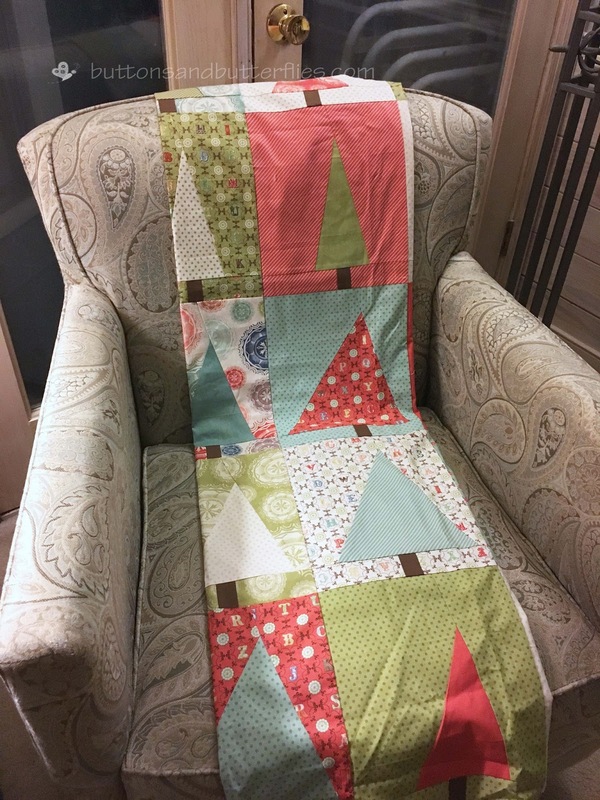 It was well received and my mom requested I make it a wall hanging quilt. I brought it home and instantly debated about the backing. For the quilting, I went with alternating wavy and swirl backgrounds and did the same "garland" swoops on the trees. 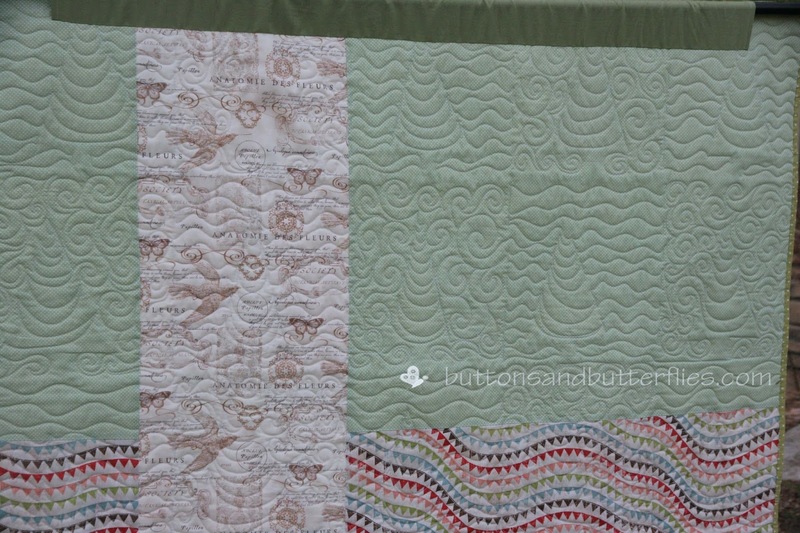 I used double batting because I wanted the quilting to be able to be seen from afar while hanging on her wall. I do love how the quilting showed up on the backing also. 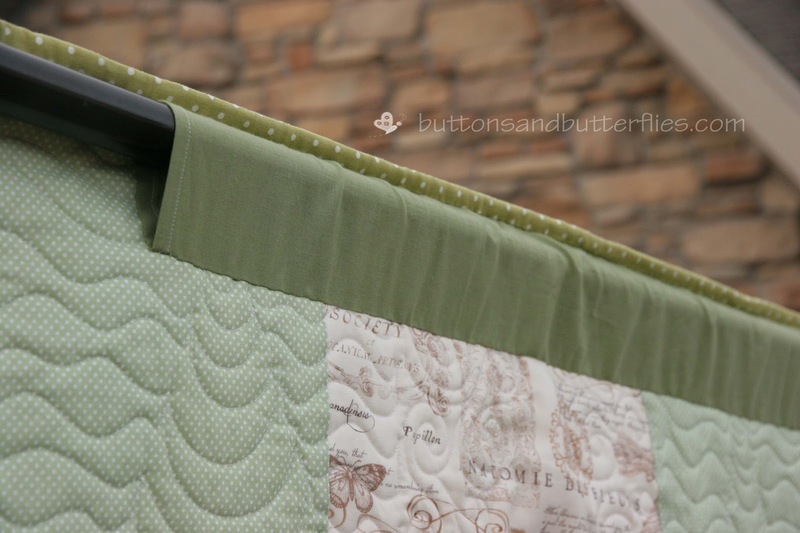 I pulled the green dotted binding from my stash! 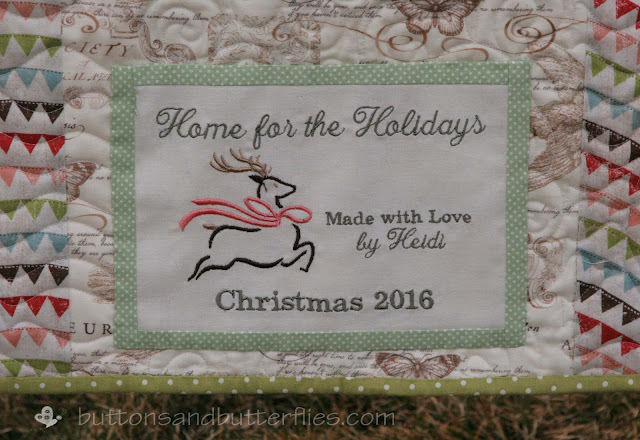 Added an embroidered quilt label to commemorate the special occasion. My only regret is that I had to take pictures on a weird winter day. The sun was setting and it really gave this quilt a muddy hue. But Christmas seems so far away and I didn't want to wait one more second before shipping off to them. 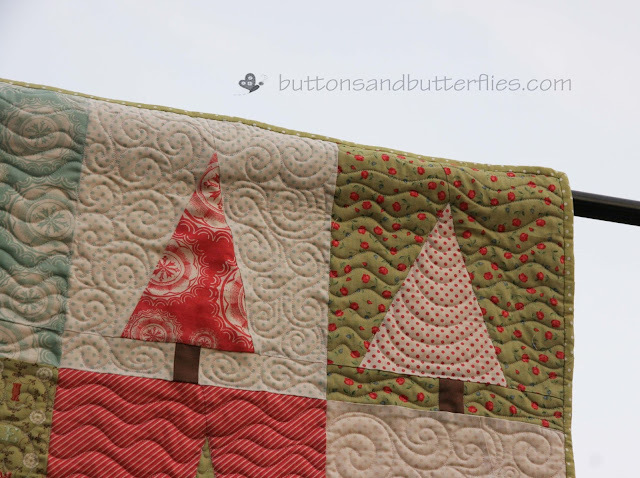 I'm calling it the Oh Christmas Tree Quilt. 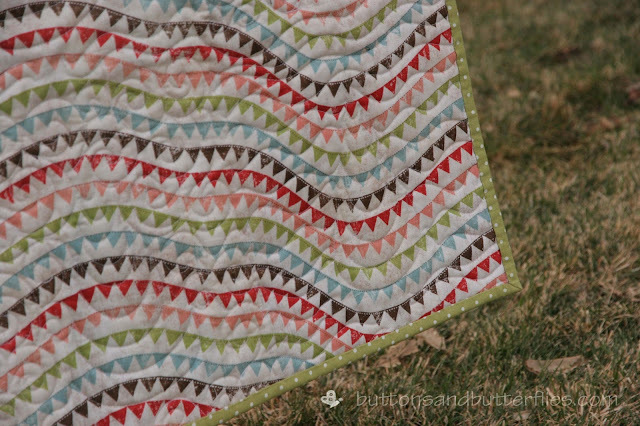 This pattern or something quite similar is on my To-Do list. 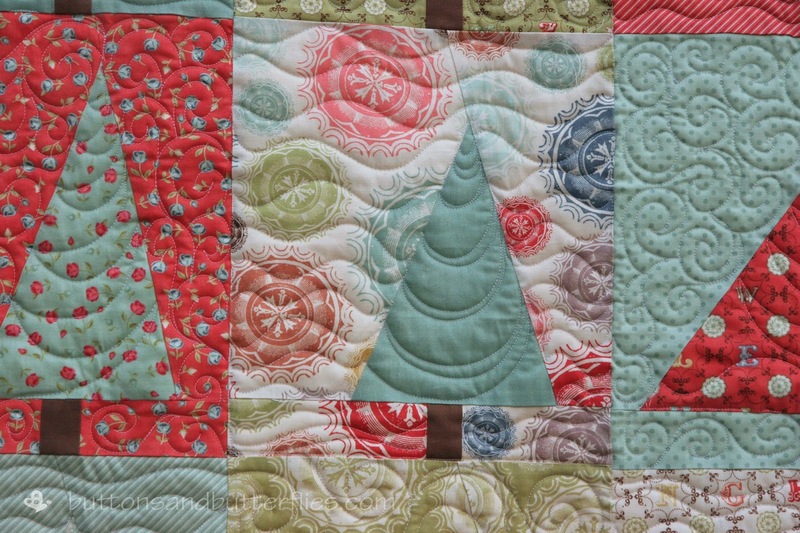 I especially like the detail of garland swoop quilting on the trees. You are a superwoman! 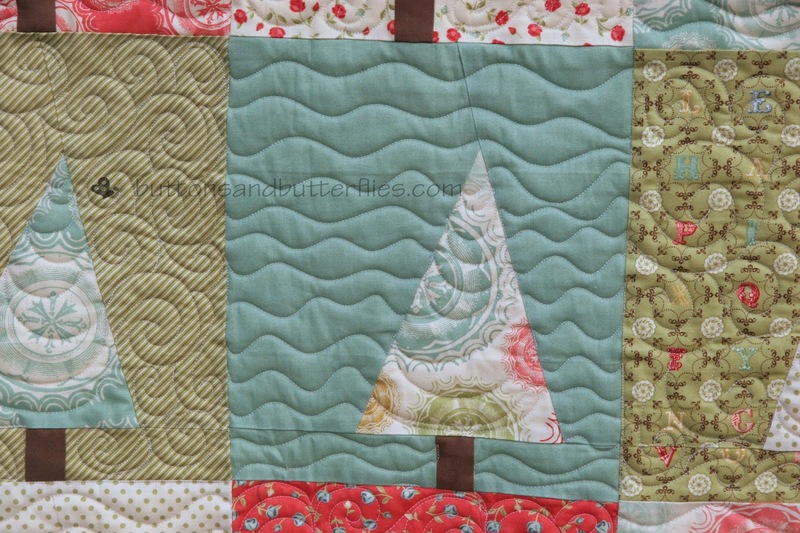 I love your quilt and especially the label. 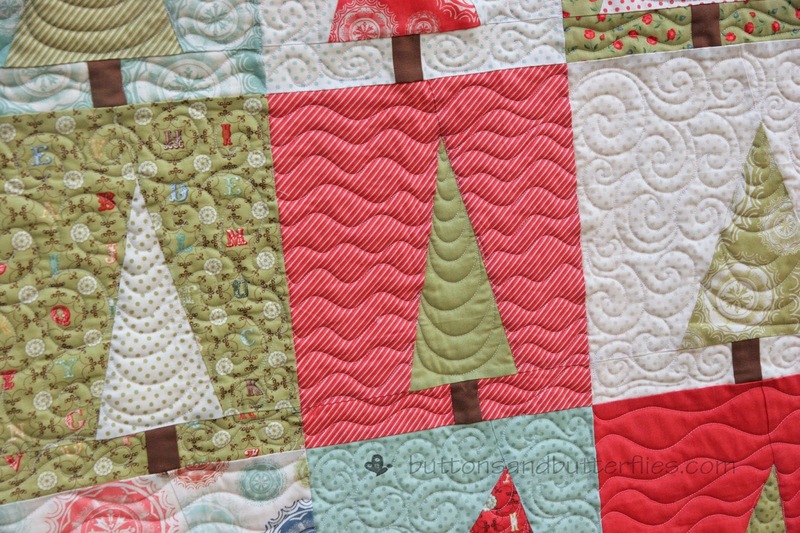 I can't believe you sewed that in one night, let alone the night before a trip, let alone with your family and all the stuff you have to do before a trip!! (I know, I have 3 kids...there is no way I could pull that off!!) Impressive!